Feplus delivers custom Belgian metal structures. Passion for metal, solid knowhow, an expert approach and a touch of sensible creativity are the distinctive qualities of Feplus. The bus station in Aalst was one of these custom structures developed and made by Feplus. 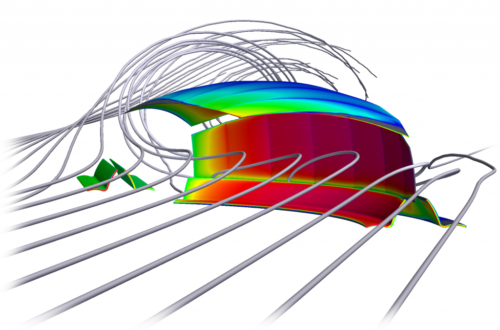 The incurrent shape of the structure lead to an incurrent approach for determining the wind loads. These kind of shapes are not incorporated in the standards such as the valid Eurocodes. Therefor Feplus asked Actiflow to calculate pressures due to wind on the bus station. The pressures were determined in CFD calculations taking into account the exact shape of the structure. From this pressure distribution, the aerodynamic forces acting on the bus station could be calculated. As a result the construction of this unconventional geometry was optimized. Design tweaks were made, resulting in the reduction of both wind loads and construction costs. Actiflow showed that state-off-the-art calculations can aid its client by getting more valid results and filling the voids in the regulations.